4 Tips to Keep Your Office Healthy During Flu Season | KeyStaff Inc.
As cold and flu season continue to bring coughs and sniffles, here are four simple ways to keep the employees in your office healthy. Encourage Hand Washing: Regular hand washing is one of the best methods of flu prevention. Post signage to remind employees to wash their hands frequently. Make Hand Sanitizer Available: Employees may not always take the time to go to a washroom to wash their hands every time they sneeze or after handling various items, but if hand sanitizer is around they are likely to use it. Keep it out in the open in high-traffic areas throughout the building. Stock Tissues: Make sure to have boxes of tissues in common areas and within easy reach of employees. Schedule extra or more thorough office cleanings during cold and flu season to help prevent the spread of germs. Make sure knobs, handles and switches don’t get missed. Provide your employees with disinfecting wipes and encourage them to sanitize their work area often – phones, computers, desktops, and workstations. If you don’t want the flu to spread, try preventing it from entering the office in the first place. Send a company Sick Policy reminder and urge your employees to use their sick days if they have the flu or, if possible, work remotely. Remind employees that if they’re sick, the best place for them is at home. Losing one employee for a day or two can save you from losing multiple employees for weeks. Encourage your employees to take care of themselves by making healthy food choices, drinking lots of water and taking short breaks. These things along with regular exercise boost the immune system and really help our bodies fight illness and stay in good health. 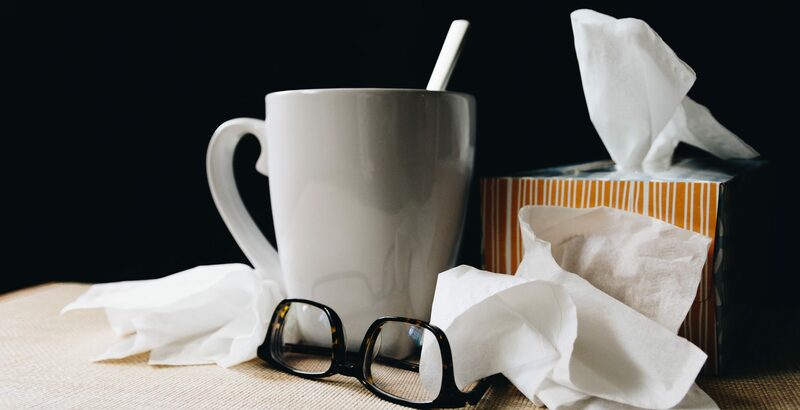 Following these preventative tips and making sure your employees do their best to help will keep your business running smoothly and hopefully flu-free.